When searching for a classic Porsche 356 for sale, buyers are often confused between several available soft-top options that were available throughout the more than 15-year production run. In fact, a Porsche 356 with a soft-top can be a Cabriolet, a Speedster, a Convertible D, or a Roadster. The 1957 Porsche 356A Cabriolet is the soft-top equivalent of the Coupe. One of the characteristics that will point out a true Cabriolet is the windshield frame. On the Cabriolet, the frame is the same shape as the Coupe and is painted the same color as the rest of the body. On the other hand, Speedsters, Convertible D models, and Roadster are special cars that do not have an equivalent Coupe model and feature removable chrome windshield frames. The Cabriolet and Coupe models were available throughout production, while the Speedster was available until 1958, the Convertible D was available in 1959, and the Roadster from 1960 to 1962. For many Porsche 356 enthusiasts and collectors, only a Cabriolet will do. Because Coupe models dominated production throughout the life of the 356, the Cabriolet models are highly desired and sought-after. Typically found in all conditions from rolling chassis in need of complete restoration to mint condition examples the team at The Beverly Hills Car Club can assist you in learning more about these classic Porsches and can provide you with the Buyer’s Tips you need to be successful in your search. They also invite you to browse their online inventory to view the 1957 Porsche 356A Cabriolet models currently available to you at their California classic car dealership. In the meantime, they remind you to always have a third-party, pre-purchase inspection performed on any potential purchase and to conduct a thorough check for rust and corrosion, as these classic Porsches had little to no rust protection. When you’re ready to explore the 1957 Porsche 356A Cabriolet models currently available to you or to inquire about a car you see in inventory, the team at The Beverly Hills Car Club welcomes you to contact them today. Backed by years of experience in the classic car marketplace, they look forward to hearing from you and to helping make your dream of owning a 1957 Porsche 356A a reality. Connect today to get started! 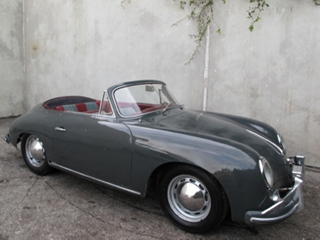 We Also Buy Classic 1957 Porsche 356 A Cabriolets In Any Condition, Top Dollar Paid.